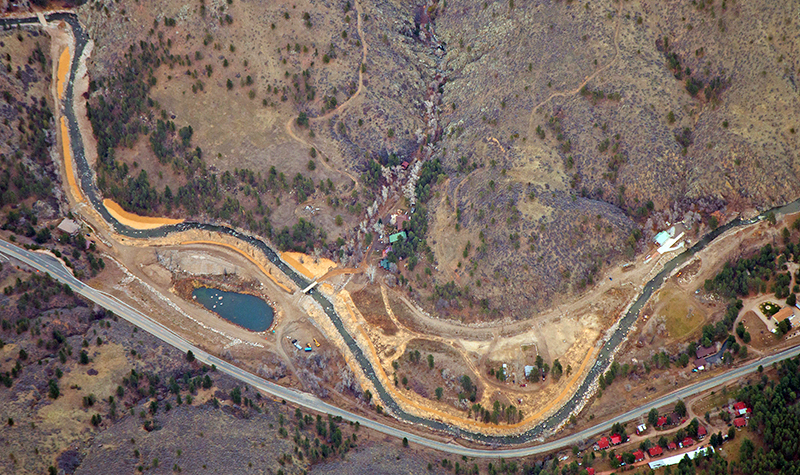 The Colorado Department of Transportation recently published several case studies celebrating major progress in effective design in flood recovery projects. The projects all relate to designs implemented in the recovery from devastating 2013 flooding. 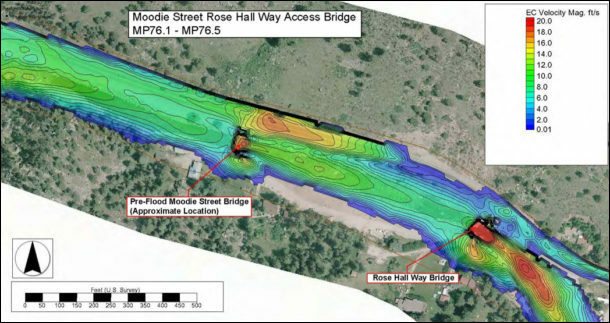 2D hydraulic modeling and spatially explicit analysis more accurately guide highway and bridge designers on where flood protection is needed. The result is multidisciplinary solutions that allow nuanced, lean designs rather than more expensive, sledgehammer allocation of embankment protection necessitated by less precise modeling and analysis. Matrix riprap changes how embankment protection is placed by reducing the amount and size of rock that must be hauled to a project, potentially saving millions of dollars. It allows protection in extreme hydraulic environments where other treatments are inadequate, unavailable, or prohibitively expensive. Challenge: Re-establish US 34 alongside a 24-mile reach of the Big Thompson River (Estes Park to Loveland) in a confined, high-energy mountain canyon in a way that provides resiliency for the highway and the area’s ecology in future flood events. Innovative engineering and construction solutions were needed to accomplish this within the available budget and to overcome availability challenges stemming from the initial calculations of riprap revetment sizing. Solution: The design team used 2D hydraulic modeling to optimize design equation safety factors and reduce rock revetment sizes. The team used matrix riprap to provide resiliency while greatly reducing needed rock volumes (33%) and cost ($9 million in savings) with construction protocols that can be used to cut costs and construction time on projects across Colorado. 2D hydraulic analysis eliminated redundancy and raised public confidence in the designs. 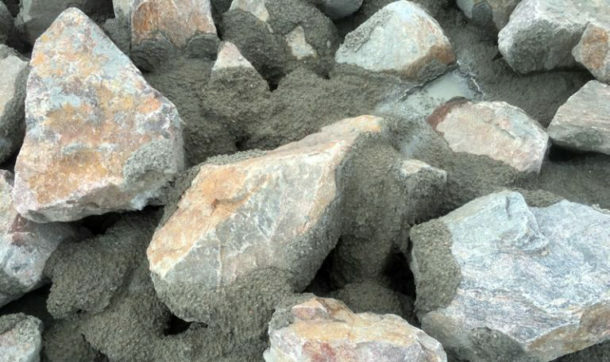 With the matrix riprap technique, smaller, typically 9- to 12-inch, locally available rocks are strategically placed in layers on the riverbank and then “glued” together on site with a cement-based grout mixture. This results in an armor layer that is approximately one-half to two-thirds the thickness of a comparably performing ordinary riprap installation. Challenge: Mitigate lateral migration of the South Platte River channel to reduce the immediate threat of failure of the south abutment of bridges at SH 55 near Crook during flood events. This risk derives from the river’s geomorphologic response to the influx of 2013 flood sediment and subsequent channel migration. Post-flooding riprap efforts failed to prevent south abutment embankment erosion, and an original design indicated a costly river training implementation would provide merely two years of protection. Solution: Addressing errors in the original 1D and 2D models, CDOT created a new 2D model and adapted its results to more accurately estimate scour using HEC-18 and HEC-23. Ayres and two other firms collaborated with CDOT to construct a project with a 50-year level of protection at approximately half the original cost, saving about $1.8 million. The collaboration allowed for swift design modifications and analytical alternatives and showed that using 2D hydraulic analysis during design improves calculation accuracy and reduces construction costs. 2D modeling provides greater accuracy than 1D in terms of not only the depth at which flooding can occur, but also the speed of the water and how the intricacies of sinuous channels, confluences, and bridges affect inundation. The much more visual nature of 2D models’ graphic output also lets engineers more effectively convey their results to non-technical stakeholders and the general public. Challenge: Retrofit major bridges over the South Platte River to reduce scour potential and remove their scour-critical status, involving 16 structures on six crossings from Fort Morgan to Julesburg (US 385, US 6, SH 52, SH 55, SH 59, and SH 63). The original design required 13,259 cubic yards of riprap revetment to protect 16 structures, based on outdated means and methods not supported by federal HEC-23 and HEC-18 guidance. Solution: Through 2D hydraulic modeling, 14 structures were optimized for scour protection, two structures were eliminated from the project, and riprap volume was reduced 25% at a savings of $500,000. The project demonstrated the superiority of 2D analysis over 1D in guiding the design of scour protection revetment. This example shows how 2D modeling provides a more accurate representation of complex hydraulic conditions encountered in the real world. Brian Varrella, PE, CFM, hydraulics unit lead for CDOT’s Region 4, quantified the benefits of these projects’ innovations for the Federal Highway Administration’s Resource Center, crediting collaboration with private consultants for making the positive results possible. Partners: Following are the key players in each of the above projects: US 34 – CDOT Loveland Residency, CDOT Flood Recovery Office, Jacobs Engineering, Muller Engineering, Ayres Associates, and Kiewit Infrastructure; South Platte River Lateral Migration – Colorado Water Conservation Board, CDOT Sterling Residency, AECOM, Ayres Associates, and Muller Engineering; South Platte River Scour Countermeasures – CDOT Sterling Residency, Tezak Heavy Construction, and Ayres Associates. 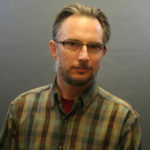 Will DeRosset, PE, CFM, is an expert in water resources engineering, bridge hydraulics, and hydraulic modeling. He has significant experience in 1D and 2D steady and hydrodynamic hydraulic models, including HEC-RAS, SRH, RMA-2V, STWAVE, FESWMS, FLO-2D, CCHE-2D, and UNET. He played a key role in the US 34 project. 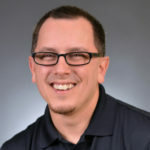 Anthony Alvarado, PE, CFM, offers clients expertise in bridge hydraulics, scour analysis, countermeasure design, hydraulic modeling, floodplain mapping and permitting, and GIS projects related to hydrology and hydraulics. Anthony worked with CDOT at the Incident Command Center in Loveland in the months after the September 2013 floods as part of the post-flood recovery efforts. He was involved in all of the projects discussed in this post.